Young Chefs Up For Culinary Revolution? Food as theatre took on a different meaning recently, when the Euro-Toques Young Chef of the Year 2012 reached its dramatic conclusion at a pop-up event in a mystery location – which turned out to be the Smock Alley Theatre in Temple Bar, a gem of a place that’s newly re-opened after a closure of many years. The evening was an interesting one on many levels and, for the five finalists, it was the last leg of a 3-month competition that saw 24 year-old Ciarán Elliott (24) take the title; originally from York in the UK, he is currently working in Restaurant Patrick Guilbaud while studying in the third year of a B.A. in Culinary Arts in DIT Cathal Brugha Street. His prize will involve plenty of hard work, but he should relish every minute of it as it’s an all-expenses paid stint at renowned three Michelin starred Spanish restaurant ARZAK in San Sebastian. 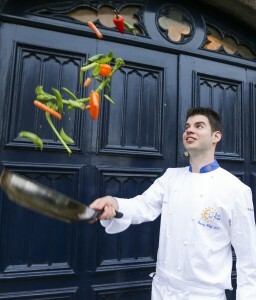 The Young Chef competition is now in its 22nd year, and is currently run in association with Failte Ireland, who sought ‘Young Chef Heroes who can contribute to developing an identity for Irish cooking and promoting Ireland’s culinary reputation at home and abroad.’ Failte Ireland will work with all five finalists in the coming year on a variety of promotional activities. The grand finale – a meal cooked by the finalists, but which was not part of the competition (the final cook-off having previously taken place at Chapter One) – inspired reflection on Euro-Toques Ireland, and the vital role it has played since its inception in 1986 by Myrtle Allen and several like-minded colleagues. Their intuition and dedication led to the development of a responsible, ingredients-led Irish food culture with the local artisan producer rightfully placed at the centre of kitchen activities – ‘the building blocks of good cooking’ as the great French chef Paul Bocuse calls the ingredients that are so precious to committed chefs. Other organisations and individuals have since leapt on the bandwagon (and that’s fine, up to a point, as Ireland’s developing food culture needs all the help it can get), but it was Myrtle Allen and the Euro-Toques members who led the way in recognising that local foods and their producers must be supported – and the young encouraged. The basic Euro-Toques philosophy may seem closer to the simpler brasserie food that’s currently popular than the intricate cooking of three-star Michelin restaurants but, if the possibility of working in kitchens at that level inspires young chefs to go for gold, that’s all to the good. For, ironically in this time of celebrity chefs and ‘culinary revolution’, we are seriously short of chefs. 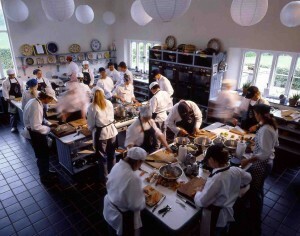 The Restaurants Association of Ireland chief executive Adrian Cummins recently announced that there is a critical shortage of trained chefs – one of the very few areas where there are job opportunities at present – but, as always, help from the Allen family is at hand: the next Ballymaloe Cookery School intensive 12 Week Certificate Course – designed to teach students the skills they need to earn their living from their cooking – starts Monday 7th January, 2013 – www.cookingisfun.ie – watch a short video about the course. What an opportunity. I’d go for it like a shot myself, if I could.